We’d love your help. Let us know what’s wrong with this preview of The Accelerated Learning Handbook by Dave Meier. Accelerated learning is the use of music, color, emotion, play, and creativity to involve the whole student and enliven the learning experience. The Accelerated Learning Handbook is the first definitive book to explain state-of-the-art accele Discover how today's corporations are benefiting from accelerated learning to speed training time, improve results, and reduce costs. 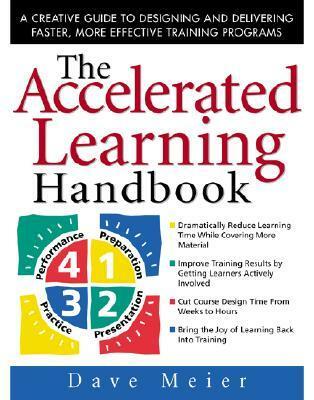 To ask other readers questions about The Accelerated Learning Handbook, please sign up. An interesting concept, but the ideas are never really fleshed out. There's a lot of repetition and lists. Skimming the introduction pretty much gives you the entire book. Some in-depth dissection of AL lessons and techniques would have gone a long way. As a professional trainer, I like to read books that help improve my training skills. I'd read about the theories of accelerated learning in the past, and wanted to see them in a more practical context. I should start by saying that this book does contain some useful ideas about making training more dynamic, involving and interesting for learners, which can't help but make it more effective. Author Meier also provides some good "Examples from the field" that help to illustrate what he's talking As a professional trainer, I like to read books that help improve my training skills. I'd read about the theories of accelerated learning in the past, and wanted to see them in a more practical context. I should start by saying that this book does contain some useful ideas about making training more dynamic, involving and interesting for learners, which can't help but make it more effective. Author Meier also provides some good "Examples from the field" that help to illustrate what he's talking about in a more concrete way. But unfortunately, at 15 years old, the book is also hopelessly out-of-date. The technology the author vaguely describes is ancient by today's computer standards, so it's difficult to apply. He strongly advocates the use of overhead transparencies, which nobody uses any more in the age of PowerPoint. He barely mentions the Internet, only briefly touching on its potential. Many of the companies listed at the back don't have websites, some don't even have an email address, and some have doubtless gone out of business since this book was published. But this is trivial as you can always find resources if you look. What's worse is what he believes about learning that is, quite frankly, wrong. I'm the first one to agree that most presentations are terrible, but this guy seems to think that the inability to sit still for a few minutes is the fault of the presenter, not the listener. He blathers on about left and right brain dominance, even though that's just a myth. He also talks about learning styles, another legend that research has thoroughly debunked. He says learners should assess themselves - while it can help to some degree if they try to gauge what they've learned, over 20 years' training experience tells me that a non-expert learner unfamiliar with educational techniques is not automatically a good self-evaluator and needs a lot of support in this task. He makes a lot of sweeping generalizations about the effectiveness of his techniques in comparison with traditional modes of learning. In an attempt to justify his assertions, he sometimes cites research, presumably found in the books mentioned in a reference list at the back, but he does not specify from which text he got his "facts", so it's impossible to follow up. About half-way through the book, he also stops providing practical examples of training that use his techniques: the sections on imagery, natural light, aromas, computers, and course design are all missing this helpful feature. It makes you wonder just how effective these are. And there is no mention of how well these techniques work across cultures, or how to adapt them for such application. Excellent guide to experiential learning with tips on how to design and implement. The thought is to present the material and let the learners learn. Also love the idea of putting joy in learning and that a good Accelerated Learning facilitator Cares (about their learners and the subject), is Creative (always improving to increase learning) and has the Courage to try new things. A company for whom I was doing some consulting had recently come across this book and was looking at it to reduce the time to develop and implement learning solutions. I read this so that I could understand what they liked about the approach and how it could be used. Quite honestly, I thought the book was incredibly elementary. Yes, I suppose it could appeal to folks who are just starting out in instructional design. But it does reinforce some out-of-date concepts, such as learning styles (whethe A company for whom I was doing some consulting had recently come across this book and was looking at it to reduce the time to develop and implement learning solutions. I read this so that I could understand what they liked about the approach and how it could be used. Quite honestly, I thought the book was incredibly elementary. Yes, I suppose it could appeal to folks who are just starting out in instructional design. But it does reinforce some out-of-date concepts, such as learning styles (whether or not people are visual, auditory or kinesthetic learners.) Learning styles only mean that the learner themselves prefer to learn a certain way - not that they CANNOT learn in any other way. The learning styles theory is not one that should be promoted. Kirkpatrick's Four Levels of Evaluation are also promoted in this book, which is another old way of doing things. I would never do smile sheets (Level One) again and you can't measure knowledge transfer without defining success first and ensuring that the learning is not left to chance once the learner leaves the classroom. It takes a good six - nine months before true evaluation can take place. I also fight against Level Two evaluations - life is not a multiple-choice test. I will agree that the best learning/knowledge transfer occurs when all senses are engaged. I agree that people learn best when they are actively engaged - whole body if possible. The pervasive standard of butts in chairs that extends from grade school through corporate training programs has been debunked over and over and yet no one is willing to make a change. I used to give this book out to all of my training clients. It is a great book for anyone starting a career in training delivery and design.